The Neodyme dynamic pulsing alternating magnetic treatment device emits gentle more natural sine wave pulsations of alternating North and South pole magnetism from powerful 20,000 Gauss Neodymium magnets spinning within a treatment head. Moving magnets enhance the Faraday Effect and are much more powerful and penetrating than static magnets. In the professional model, the spinning rate is adjustable thus giving control over frequency of pulsation in order to resonate with specific organs. In the home model, frequency is fixed at the optimal rate. Both systems penetrate deeply into tissues including the Bladder, Pancreas, Brain, Lungs, Bone which are not otherwise accessible to therapeutic energies. Each unit can have an optional output connector for external frequency meter to indicate precise rate which can be tuned to Rife, Schumann or other frequencies. 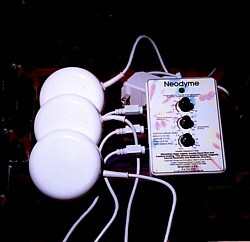 The Neodyme is very simple to use. The only control is to change frequency on the professional model. The treatment head is 9 cm diameter by 5 cm thickness and has a 6 foot (2 metres) length cable. Power is from 12 volt internationally approved adapter for any country or from 12 volt battery or from automobile outlet for use in a vehicle. Some long-distance drivers treat backache while they are driving. 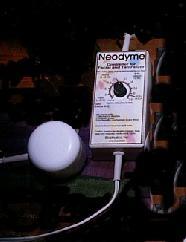 The Neodyme Electro-magnetic stimulator has helped to restore sleep, improve mood relieve pain by using patented ultrasonic and radio frequencies to gently stimulate the brain’s production of serotonin, beta-endorphin and other key neurochemicals. Many research studies have proven the safety and effectiveness of the device. Patients typically use the device twice a day for twenty minutes. The device causes no noticeable side effects and is safe to use while taking medication. Notes: Please select the number of Treatment Heads required.